Ubisoft's ZombiU was a launch title for the Wii U console and, going by its ratings on Metacritic, it was a pretty decent game. Three years later, it's finally coming to the PC, with a slightly modified title. 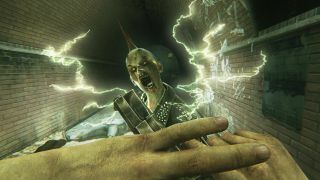 ZombiU is a first-person survival horror game in which players take on the role of a random survivor caught up in the midst of a zombie apocalypse in the great city of London. You'll collect stuff, use it to kill zombies, and stay alive as long as you can—and when you do die, the perma-death mechanic places you inside a new survivor and leaves you to choose between trying to recover your lost equipment from the infected (which is to say, animated and hungry) corpse of your old body, or letting it go and starting anew. Reflecting the fact that it's no longer a Wii U exclusive, the PC version (which is also coming to the PS4 and Xbox One) will be called simply Zombi. The core gameplay will remain the same, but of course the graphics been upgraded to take advantage of modern hardware, "to bring gamers to a new level of horror." The field of view has been expanded and can be adjusted "a little," and a pair of new melee weapons, the shovel and the nail bat, have been added. One thing that's missing is the Wii U's second screen, for which ZombiU was specifically designed. The inventory system will change as a result, and of course the "single-system multiplayer," in which a second player uses the Wii U Gamepad to placed zombies in the path of the survivor, is out too. "We decided to focus on the solo mode, as we believe this is where the ZombiU experience really lay," Zombi Producer Hélène Henry said on the Ubiblog. Zombi will be a digital-exclusive release, and is set to come out on August 18. Details will at some point be up at Zombigame.com.